Our FPL fantasy Premier League squad is now in the top 100,000 in the world and first in our cash league. 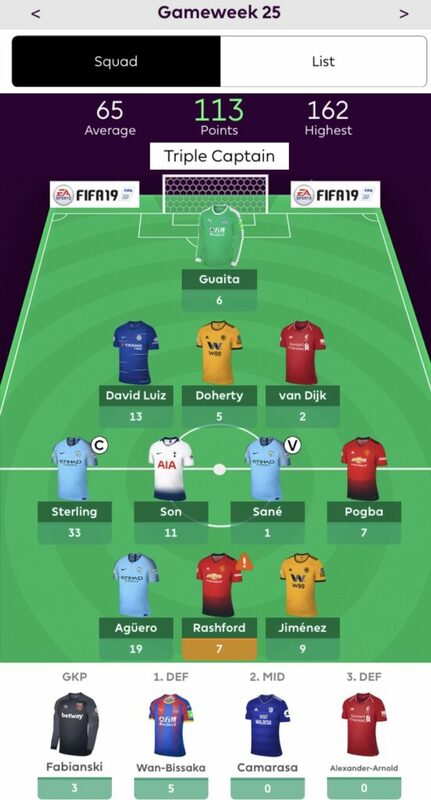 A strong wildcard play will secure our FPL gambling haul. It’s been awhile since we’ve posted an update on our FPL squad. In fact, it’s been almost half a season. We’ve enjoyed all the drama in the Premier League so far, and there’s only five game weeks left in the season. So what’s new? Well, we came in second in the first half of the season. Since then, we’ve had an excellent run of point scoring. We now lead our big money league by over 50 points, and our world ranking is near the top 1%. 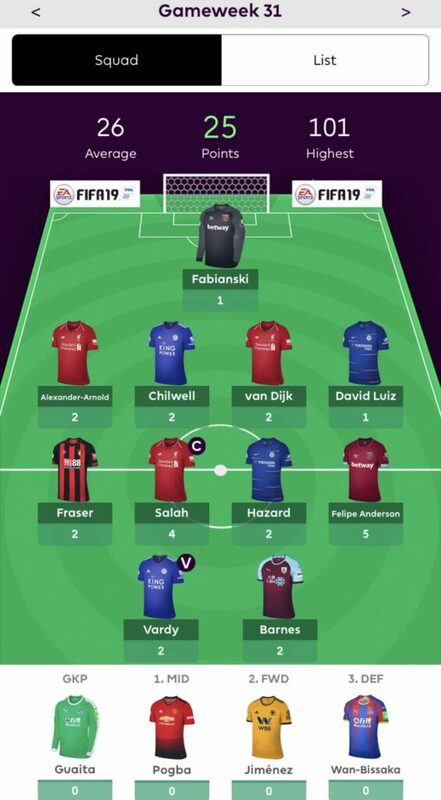 Our lowest scoring GW of the season. Last week’s point haul pushed us in the top 100,000 for the first time ever. New lineup is subject to change. The above lineup is built to use the Bench Boost chip in GW 35 without any transfers between 34/35. 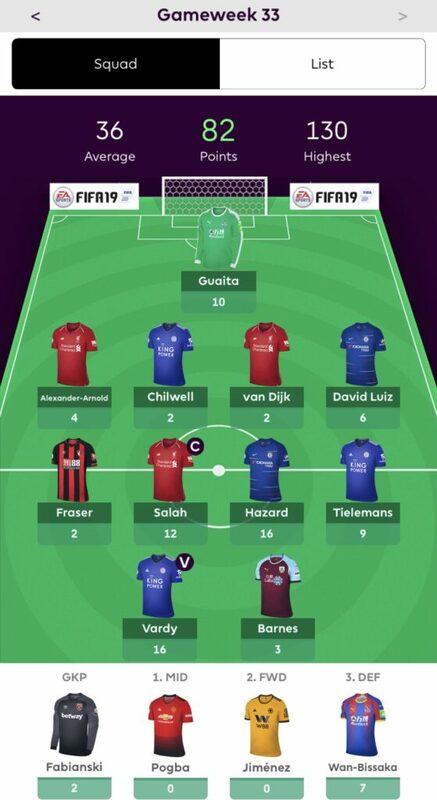 Besides the Liverpool players, every other player has a double GW in GW 35. With this lineup, our squad has no money left in the bank. This lineup is not without risk. 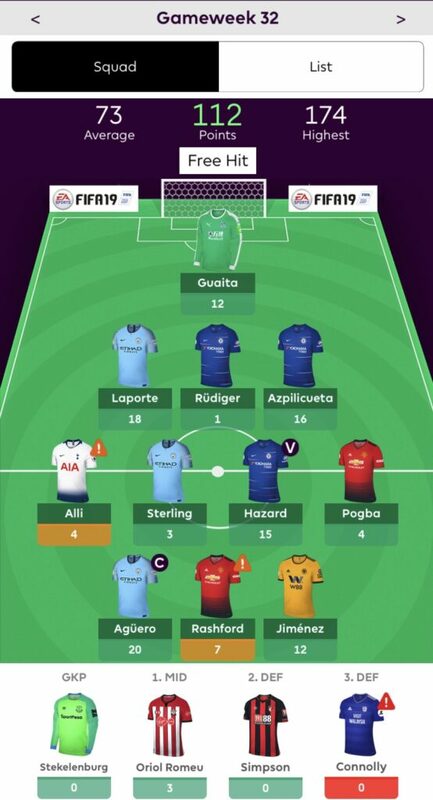 For one, individuals such as Son, Sterling, and Lacazette could be rotated out of the lineup in GW 34. Also, there’s a chance that Brighton as a whole could perform well in their double GW 34. Based on the remaining schedules, there’s a strong likelihood we will replace one of our starting midfielders with a bench player in GW 36, bring in Sergio Aguero and David De Gea in GW 37, and then a Manchester United attacker in GW 38. What are your thoughts on the lineup? 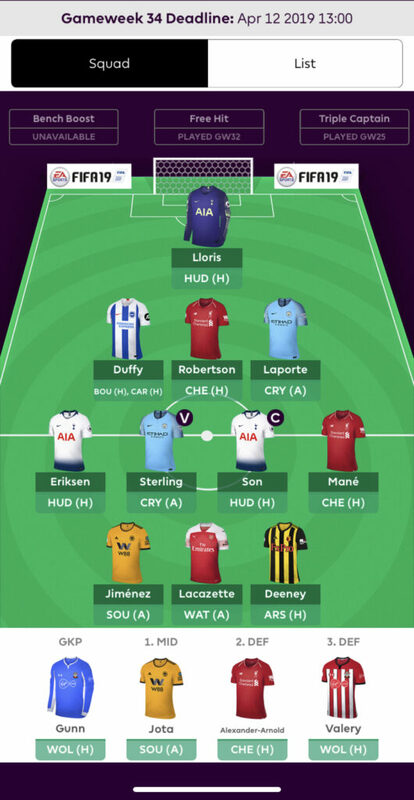 This entry was posted in Blog, StakeHaul Challenges and tagged betting, English Premier League, EPL, fantasy futból, fantasy soccer, FPL, gambling, Premier League. Bookmark the permalink.